So, how do you currently call for a cab in Harare when you need one? Give the cab driver a call? An SMS? Does it cost you airtime every time to do this? Do you always get a response on time? If you have a smartphone, (or just a regular internet connection at a desktop) there’s a new service in town you might want to give a try. It’s called Tweet-A-Cab. You guessed right; to get a cab you just Tweet for it! In what will become Zimbabwe’s most direct use of the realtime microblogging tool for business, a local cab company will use Twitter to get cab requests (and feedback) from clients. The company doesn’t only use Twitter to connect with customers; it has branded its whole business around the Twitter platform’s look. 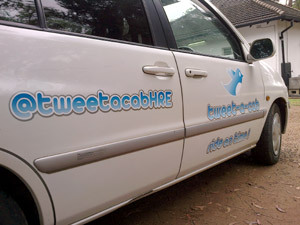 The company is called Tweet-A-Cab and its twitter profile @TweetACabHRE. So how exactly does it work? To use the service, one has to have a Twitter account and follow the @TweetACabHRE account. TweetACab will follow the user back so that there’s two way direct communication between the two accounts. Now to get a cab the user just needs to send their number in a DM (Tweetese for Direct Message) to the company. TweetACab will then call the user back to arrange the pickup. We got in touch with the man behind the idea Tawanda Nyagwaya last week to learn more about his new creation. He says since he started using Twitter in 2009, the number of Zimbabweans has noticeably grown on the platform and it struck him the realtime nature of the platform makes it suitable for a service like Tweet-A-Cab. So far, TweetACab is providing the service for its own fleet of cabs but says depending on the uptake they may open up the platform to other local taxi companies. The main value proposition, Nyagwaya says, is that this is a new cheap and efficient way of booking a cab because customers don’t incur the cost of phone calls. “With the festive season around the corner, many Twimbos [a moniker for a Tweeting Zimbo] will need taxicab services and we are ready to offer that. In other words, we are ready for #DecemberInZim!” explains Nyagwaya using Twitter’s popular hashtag (the #) method of tagging and categorising content on the platform. Nyagwaya adds that the business environment for them has become more competitive and that technology was changing the landscape fast. “Social media fits more naturally with this type of business” he says. TweetACab has only been in operation a little more than a week. Nyagwaya revealed that while the response hasn’t been overwhelming, “it has been good” and they are anticipating some growth. TweetACab has avoided Facebook though. “it does not suit the real-time pace of the taxicab industry” says Nyagwande. So, #WhatDoYouThink? Next time you need a taxi, are you going to have @TweetACabHre give you a ride? geeez ! are we becoming so cheap so much that we can’t even call a cab? 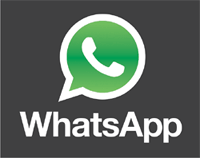 Anyway can i have the contact number for whatsapp !!! Tweet-a-cab as a registered for profit organization is likely infringing on the trademark of Twitter and misleading the public, Zimbabwean companies must be very careful. IN SOUTH AFRICA big companies like Orange and Google have already started dishing out law suits and take down notices, to illustrate the extent of this threat it might be interesting to know that a company called Orange Taxis or Orange Electronics can be sued by Orange and the matter fully contested in a court of law without dismissal. Copyrights and Trademarks must be observed carefully, because when Zimbabwe becomes open in the near future – the legal realities will bite hard. Also the marketing departments of many companies must not take liberty with un-cleared images as part of their websites or campaigns! Copyright infringement is something that US legislators are currently re-adjusting to make the consequences more damaging! Please Tech Zim run a feature on this subject. Isn’t @tweetacabHRE just a twitter handle? I am not sure if the company is called Twitter Cabs/Taxi in this case. Just loud thinking. Although the other issues you indicated are truthfull, we need enlightening on the matter of trademarks. i am sure you can write the article and give it to techzim. If there is a book(idea, dream, innovation etc) you think should be written but it is not there, then WRITE(do, innovate, live etc) IT. famous names are: Zimfacebook, a social network. There is now also zimazon. but I think I now should. experience different to Amazon.com. And when they do, they become disappointed. a brand from there. The name Ministro, unlike zimazon would have first mover advantage. will fight, thinking the fame will boost sales. Oh yeah, and all of them using open source software. @162ae3a6dc13256ca0732a320dc2aeac:disqus I dont think you get it sir. Nobody is using someone’s name here. It’s about how the service is delivered… you tweet for a cab. Tawanda, i do not think you get it sir. Someone is using someone’s name here, in a trademark, “tweet”, even describing what you do using a service called twitter. There is nothing different to calling a car a “ZimToyota” and saying we are not the japanese one. “@ tweetacabHRE” Ndho chii ichocho? It’s like saying Econet me, instad of call me. They should have simply said “Find us on twitter” than to violate so many simple business naming ethics. I invite you to join Twitter sir. You’ll understand better. Happy holidays. i think this is a cool innovation tawanda,,..im glad to see your innovation going this far coz i rmemba u mentioning it and i tho u wr juss being cocky..anyway to Mr something avo vari kuti he stole e trade mark need we run books for u first kuti unzwisisa kuti hw does sm1 infringe on a trademark? ?